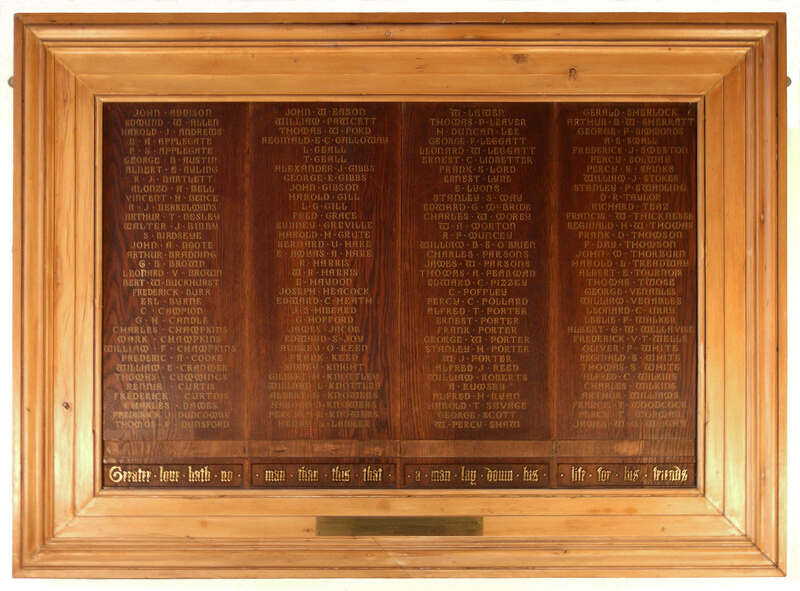 This page contains details of the men listed on the fourth panel of the 1914-18 Memorial Board at St Mary’s Church Tower, Hornsey. If you are looking for other names, you will find Panel 1: Addison to Dunsford; Panel 2: Eason to Laidler; Panel 3: Lawen to Shaw. Son of Marian H. Sherlock, of 13, Barrington Rd., Hornsey, London, and the late Frederick Sherlock. Cemetery/memorial reference: IX. C. 17. Son of Mrs. A. Sherratt, of 13, Hawthorn Rd., Hornsey, London. Cemetery/memorial reference: IIA. B. 2. Son of Henry J. and Harriet Simmonds, of 17, Brook Rd., Hornsey, London. Cemetery/memorial reference: Plot M. Row F. Grave 1. Son of Frederick Herbert and Alice Smeeton, of 1, Tottenham St., North Kensington, London. Native of Hornsey, London. Brother of Mr. H. C. Spinks, of 50, Holmwood Rd., Seven Kings, Essex. Cemetery/memorial reference: I. C. 57. Son of James and Catherine Stokes, of 46, Westfield Rd., Hornsey, London. Cemetery/memorial reference: VI. B. 4. Son of Mr. W. E. and Mary Swadling, of 118 Hillfield Avenue, Hornsey, London; husband of Constance May Alderton (formerly Swadling), of 68, Dunvegan Rd., Eltham, London. Born at Oxford. Cemetery/memorial reference: VI. B. 48. Son of Mrs. M. Taylor, of 23, Bounds Green Rd., Wood Green, London. Son of Ezekiel and Mary Teaz, of Ballymaleel, Londonderry; husband of Beatrice Ellen Teaz, of 3, Hillfield Avenue, Hornsey, London. Cemetery/memorial reference: II. A. 34. Son of Francis Norman Thicknesse (Rev. Prebendary) and Mary Sibylla Thicknesse, of St. George’s Rectory, 15, Grosvenor St., London. Cemetery/memorial reference: XXV. K. 14. Cemetery/memorial reference: Panel 87 and 88. Son of The Rev. W. I. Thorburn, of 2, Temple Rd., Hornsey, London. Cemetery/memorial reference: I. C. 33. Son of John Ligonier Treadway and Louise Emilie Allen Treadway, of 6, Church Lane, Hornsey, London. Came from Venezuela to serve. Cemetery/memorial reference: Pier and Face 9 D and 16 B. Son of John and Fanny Venables, of 114, Myddleton Rd., Hornsey; husband of Annie Ruth Venables, of 100, Hermitage Rd., Harringey, London. Cemetery/memorial reference: N. 7. 20656. Cemetery/memorial reference: III. E. 15. Cemetery/memorial reference: Sp. Mem. 4. Son of Thomas Samuel and Helen White, of 46, Alexander Rd., Hornsey, London. Cemetery/memorial reference: Sp. Mem. 19.